The X4 Power Flash arrives Pre-Loaded with DYNO Proven tune files that INCREASE HORSEPOWER and TORQUE! 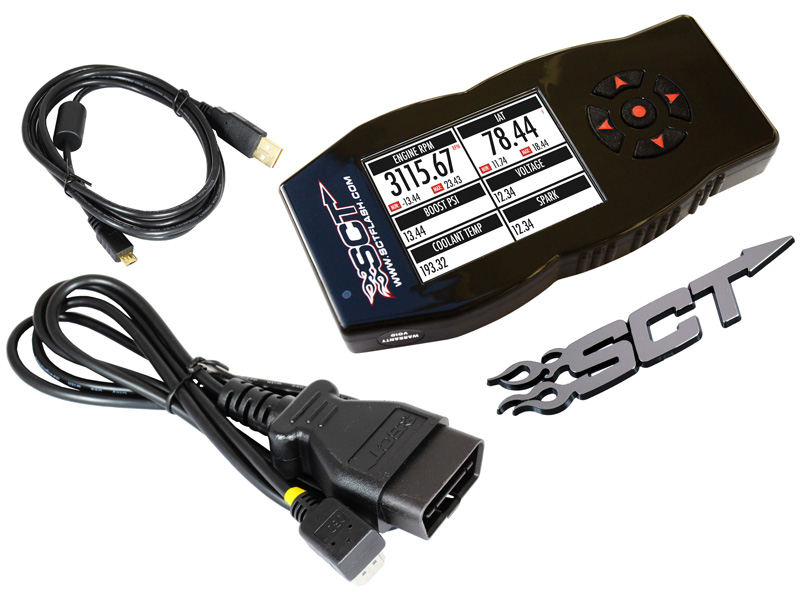 Programming your vehicle with one of SCT's pre-loaded performance or fuel economy tune files is as easy as 1-2-3. Simply plug the OBDII connector into your vehicle's OBDII port, select the pre-loaded tune file using the simple to navigate menu and within minutes the X4 programs your vehicle. Increases Horsepower & Torque! » Increases Horsepower & Torque! 1990 1991 1992 1993 1994 1995 1996 1997 1998 1999 2000 2001 2002 2003 2004 2005 2006 2007 2008 2009 2010 2011 2012 2013 2014 LX GT GTS Mustang Cobra Shelby Roush Saleen & Steeda Vehicles. *This product is not legal for sale or use in California on pollution controlled motor vehicles No one else can stack up to the bold clean styling of our aftermarket Billet dress ups, Street Strip & Racing Suspension & Performance Parts for your late model American Muscle Car!